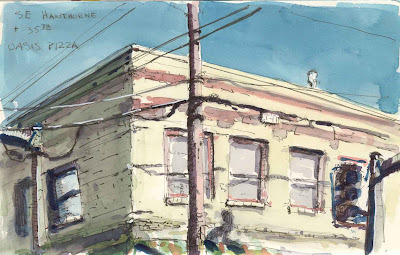 The corner of SE Hawthorne and 37th is, to my mind, the center of the Hawthorne District of Portland. It's an area that's changing from counterculture to yuppie. I'm sure both of those words are out of date but you get the picture. I did this from the window of what is now a coffee shop but for years it was a Hippie clothing store, The Blue Butterfly. I miss the incense smell coming out of that shop. Just stumbled across your blog and wonderful little paintings. I think the sketchbook is a great idea, reminds me it's something I would and should do...if I travelled more. Keep it up. enjoyed your work especially the watercolor sketches and the painterly images. Also, levitating in the studio, must try! A wonderful way to really know your immediate world. Ira and Memi, thanks so much for stopping by. Both of your blogs are inspiring. Ira, I'm sure you've levitated in your studio you just haven't noticed.